I thought I’d share some of the photos I’ve taken of my Christmas Angels. After all, Christmas will be here before you know it, or at least before you’re ready. The truth is out. I like to collect things. 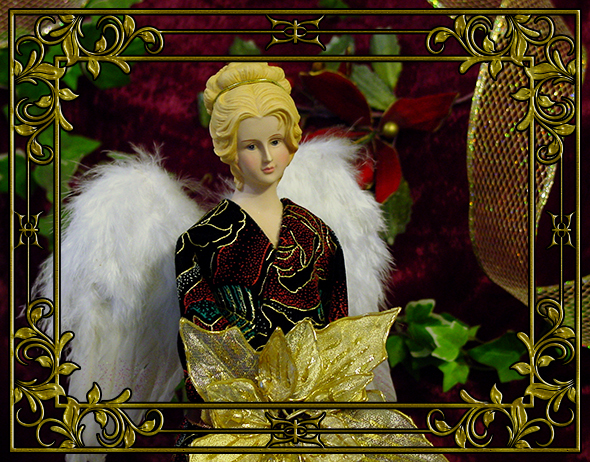 And among the things I like to collect are Christmas Angels. 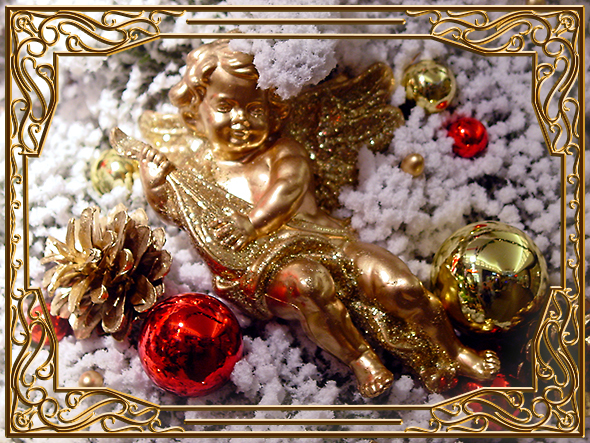 From bisque candle holders to tree ornaments, and just about anything in between, Christmas at our house is positively angelic! And being a photographer, too, of course I have to take pictures. Here are some of my favorites. The decorative frames for each photo were added in Photoshop. All images are copyrighted and may not be used without permission. This is the angel that started it all. Besides our big tree in the living room, I have a smaller artificial tree I bought to put in the tall skinny window in my office at work. The usual tree toppers I could find were all too big for this 4 foot cutie, so when I found these smaller angels at a local store, I didn’t hesitate. She has the clear plastic cone that allows her to go on top of the tree, or sit on a table. She also has a hanger, so she can be used on the branches of the Christmas tree instead. I decided then that I was going to buy another one each year. Unfortunately, I haven’t seen these smaller tree top angel since. But I still buy at least one new angel ornament every year at Christmas. 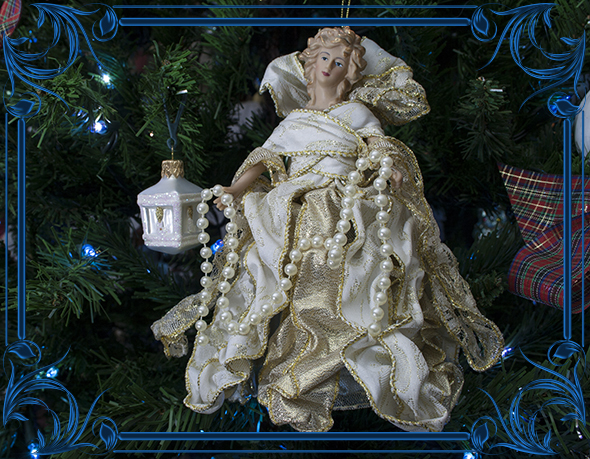 This porcelain figurine commands an honored spot in the hutch all year long. At Christmas time, she may be brought out for more prominent display, or the hutch may be reorganized to highlight her and other Christmas decorations. Shown here with silk magnolias in the foreground and a silver glitter black velvet background. This angel is a bit of a cheat. 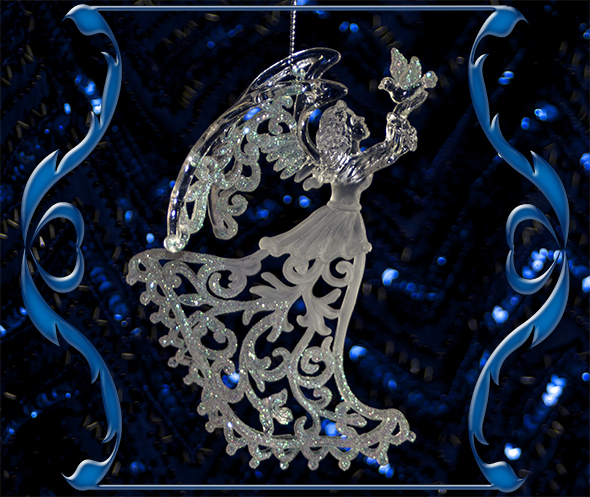 As the grand prize for an annual fund-raising raffle, I have made two tree-top angels. 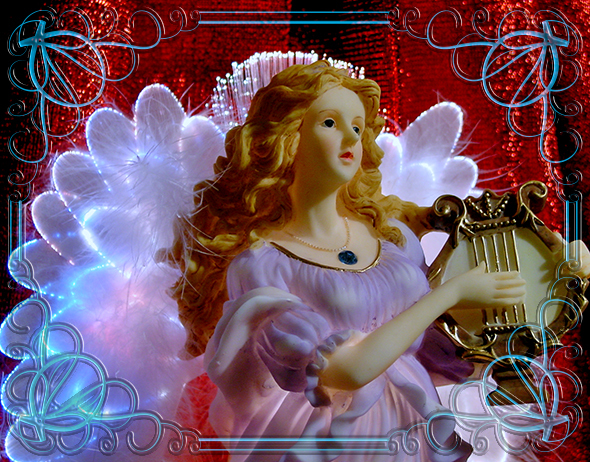 The angel here is not one of those, though the velvet I used here was on the second angel. This angel is just the cone and head, draped with fabric. The wings are only pinned in place. The gold poinsettia is hiding the fact she doesn’t have any hands. The illusion is completed with the addition of red velvet draped behind, along with silk ivy and a gold mesh ribbon. She’s still pretty. Perhaps one day I can slow down enough to make another angel. It’s a lot of work, but very satisfying. 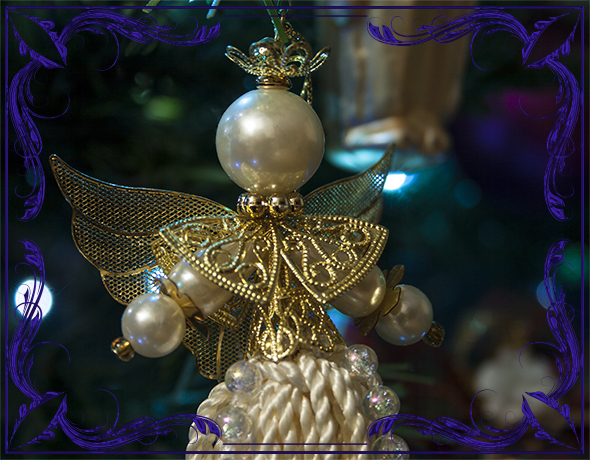 This elegant ornament encloses a porcelain angel figurine in a clear glass globe, which is embellished with gold and teardrop pearls. I always place this ornament about eye level on the Christmas tree and facing the room where I can see it whenever I walk by. I found this little gem at a craft store. The mesh wings are a perfect match for the faux pearls and gold filigree jewelry findings. The skirt is made from lots of shiny decorative rope, with a couple strands of crackle beads to dress it up a bit. 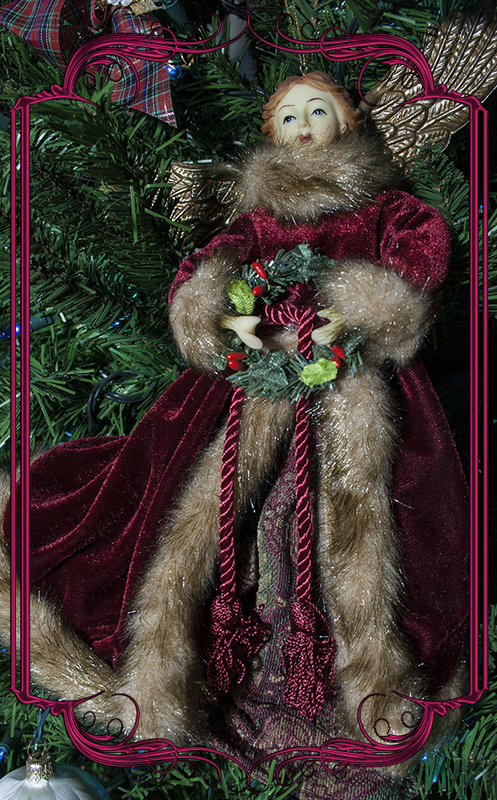 This luxurious looking angel has robes of deep red velvet and faux fur trim, and a dress of brocaded fabric. Everything about her shows care and attention to detail. Except the wings. I’ve never liked those thick, clunky plastic wings. One of these Christmases, I’m going to have to do something about that. 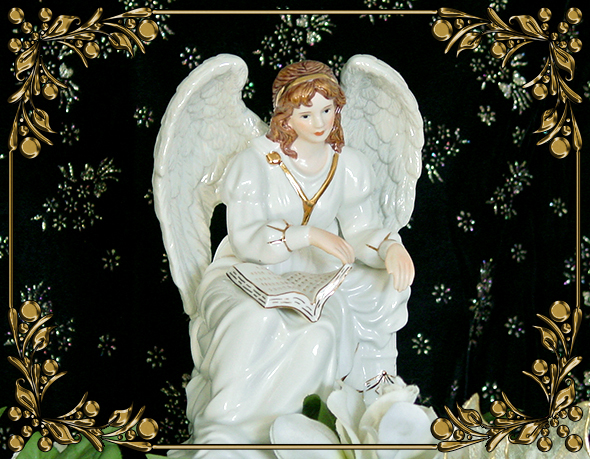 This delightful resin angel stands over a foot tall, and graces our fireplace mantel every year. Besides the fiber optic wings, there is a light inside so that her face and body light up too. She’s one of the first decorations my husband puts up every year. He likes angels, too. 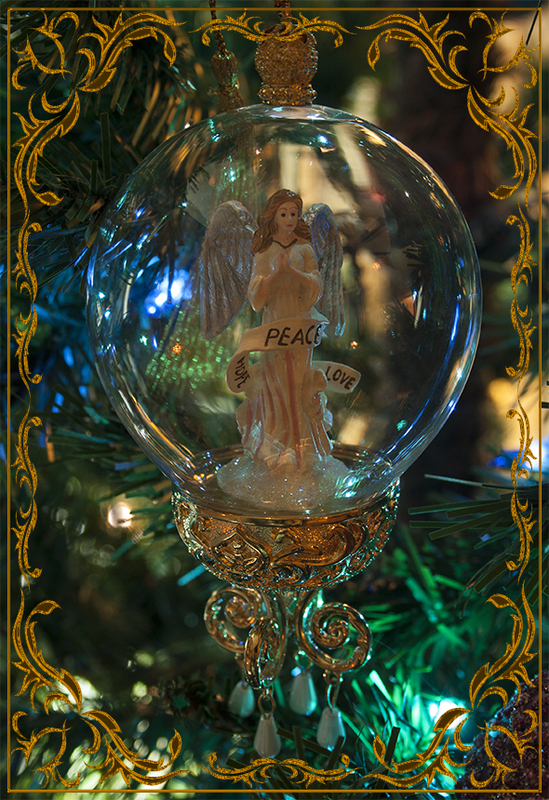 This delightful ornament is one of three we bought Christmas 2012 at a wonderful little store along the McKenzie Hwy, outside of Blue River, Oregon: Christmas Treasures. Although this angel has the look of expensive Lalique crystal, it’s actually made of plastic and the least expensive of the three. The wings and the skirt have a light dusting of glitter so fine I’d call it fairy dust instead of glitter. Now that I’ve had them a while, I think this is my favorite of the three.